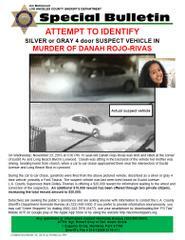 Anyone with information, contact the L.A. County Sheriff’s Department Homicide Bureau at (323) 890-5500. If you prefer to provide information anonymously, you may call "Crime Stoppers" by dialing (800) 222-TIPS (8477), use your smartphone by downloading the “P3 Tips” Mobile APP on Google Play or the Apple App Store or by using the website http://lacrimestoppers.org. On Wednesday, November 23, 2016 at approximately 9:30 P.M., 16 year-old Danah Rojo-Rivas was shot and killed at the corner of Euclid Avenue and Long Beach Blvd in Lynwood. Danah was sitting in the backseat of the vehicle her mother was driving, heading home from church, when a car to car chase approached them. During the car to car chase, gunshots were fired from the above pictured vehicle, described as a silver or gray 4 door vehicle, possibly a Ford Taurus. The suspect vehicle was last seen west bound on Euclid Avenue. L.A. County Supervisor Mark Ridley-Thomas is offering a $20,000 reward for information leading to the arrest and conviction of the suspect(s). An additional $10,000 reward has been offered through two private citizens, increasing the total reward amount to $30,000. Detectives are seeking the public’s assistance and are asking anyone with information to contact the L.A. County Sheriff’s Department Homicide Bureau at (323) 890-5500. If you prefer to provide information anonymously, you may call "Crime Stoppers" by dialing (800) 222-TIPS (8477), use your smartphone by downloading the “P3 Tips” Mobile APP on Google play or the Apple App Store or by using the website http://lacrimestoppers.org.